The Long Pond trailhead is the most used route by hikers. This short trail leads directly to the coast. The Long Pond trailhead is along route 431, just 13 km from Woody Point (3 km from Trout River). The trail is 4.5 km to the beach, 9 km return. The beginning section of the trail heads off across a barren landscape of frost-cracked orange-brown peridotite boulders. The trail rises to a viewpoint and the rock-type changes. Hikers should turn left at the junction, where the trail then descends through forest to the coast. The Long Pond route ends in a staircase leading down to a beach beside a cliff of pillow lava. Stay on the trail. Avoid walking close to the cliff edges at the coast as some parts are undercut. Return by the same route that will be uphill most of the way and is steep in places. Those seeking a longer hike can leave from either the Long Pond or Wallace Brook trailheads and complete a loop to return to their starting point. 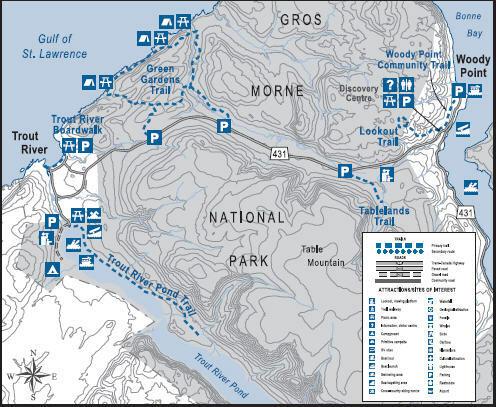 Wallace Brook trailhead is along route 431, just 11 km from Woody Point (5 km from Trout River). The return trips are: 14.5km from the Long Pond trailhead, and 16 km from the Wallace Brook trailhead. Regardless of your starting point, be prepared to ford Wallace Brook in two places . The water in the brook can be very deep after a rainfall, thus it is advisable to take extra footwear (i.e. sandals). This is a long hike over some difficult terrain. Stay on the trail. Avoid walking close to the cliff edges at the coast as some parts are undercut .